At the invitation of the producer Ope Banwo, high ranked members of the Press and nollywood stakeholders gathered at Hall 1 of the Silverbird Galleria on Tuesday 12th of April, 2011 for the first official press screening of the much talked about movie –GHETTO DREAMZ. The movie that tells the story of the life of the late rap artiste DAGRIN left many ribs cracked and few eyes dry at the end of the screening. The movie, directed by fast rising Daniel Ademinokan, moved at a brisk pace while laying bare some of the mysteries surrounding the life of Dagrin and the challenges he had to deal with to survive as an artiste with a focus on indigenous rap – a brand that was not readily accepted by the public initially. Then, in the last 30mins of the film as the gripping tale of struggle and rejection roars towards the climactic death of Dagrin at LUTH Hospital, most of the people in the audience could not hold back hot tears. Many people in the audience started sobbing freely as the drama of the last minutes of Dagrin on the hospital bed soundlessly unfolded. As Rachael Oniga wails for her dead son in a silent scream and anguish, the temperature in the hall dropped drastically for a few minutes and then erupted in hot tears from the gathered press men and celebrities. Amongst the celebrities present was Kenny Saint Brown who ran out of the hall when she obviously was unable to control her tears as she watched the final days of Dagrin in a movie. Accosted by reporters who wanted to know what led to her emotional breakdown, KSB confided it was sad to watch Dagrin die on screen because they have been so close before his death and she was one of his mentors. 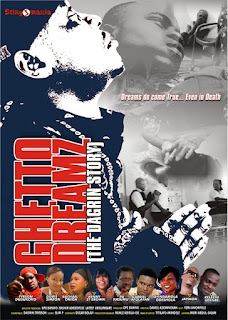 The VIP Red Carpet premiere of ‘Ghetto Dreamz’ is set to take place on Friday, April 22, 2011 at the Atrium, Cinema Floor of the Silverbird Cinemas in Lagos and will begin showing at cinemas across the nation the same day. More interestingly the Producer of the movie, Ope Banwo is giving out free memorabilia of Dagrin, like Handkerchiefs, Tshirts and Caps to the first 100 people to buy the GHETTO DREAMZ movie ticket in each of the cinemas across the country. Very sad indeed. The movie premieres tomorrow and I cannot wait to see it. I'm all teary from reading this post.